Pumpkin is an excellent source of beta carotene which is a powerful antioxidant.Beta carotene is converted by our bodies to vitamin A which is an important nutrient for eye health and good vision, healthy skin and helps support the immune system. Most people don’t grab a muffin thinking they’re eating health food but, in my opinion, being able to sneak in some beneficial nutrients is a bonus. And, don’t worry, even your toughest little critics won’t know the difference! 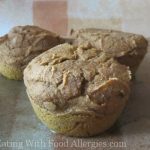 Love baking with pumpkin as much as I do? 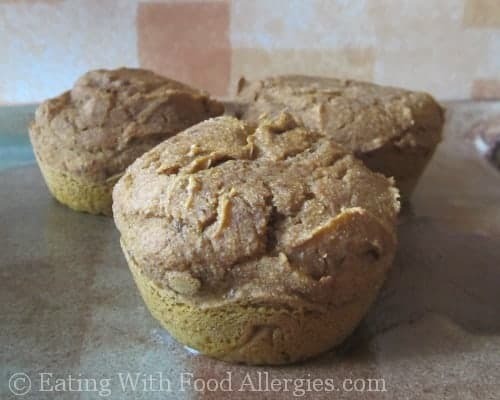 These muffins are free of dairy, eggs, soy, wheat/gluten, peanuts, and tree nuts. In a small bowl, combine the flax seed meal and warm water. Let sit for 3-5 minutes until the mixture is thickened. In a mixing bowl, cream together the sugar, pumpkin puree, flax seed meal mixture, vanilla and "safe" milk. In a separate bowl, combine the flour, salt, baking soda, cinnamon, nutmeg and cloves. Add dry mixture to the pumpkin mixture and stir until dry mixture is moistened. Spoon batter into muffin tin filling each muffin cup about 3/4 full. Bake for 20-25 minutes or until a toothpick inserted in the middle of one of the muffins comes out clean.